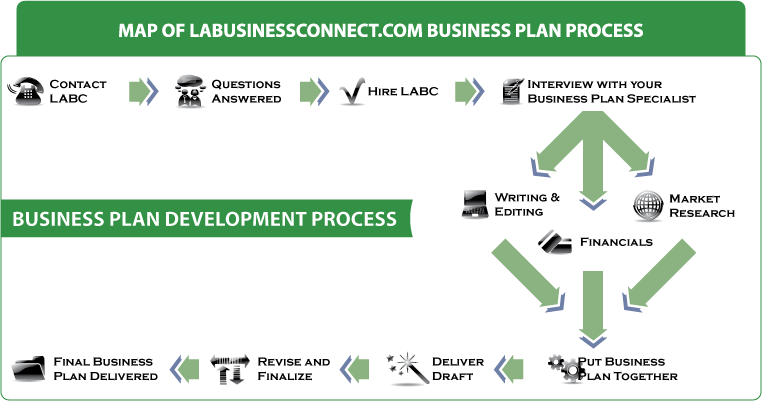 Contact LABusinessConnect.com and have any of your questions or concerns answered. We'll do our best to provide you with thorough answers to any of your questions. Additionally, once we have a better understanding of your business and the purpose of the plan we provide you with an over the phone quote followed with an email quote. Once you Hire our Business Plan writing team, via contract and deposit payment (50% of the Business Plan Writing fee), we then schedule a kick-off interview with your Business Plan Specialist. This helps you get to know your Business Plan Specialist, and allows your Business Plan Specialist to learn more about your business concept. This call is the first of many exchanges required for us to thoroughly understand your specific needs and to develop a strategy for approaching your business plan. The first two days of the project are dedicated to getting as much information from you as we can. At the same time, our team of research specialists begin to compile relevant industry data so we can provide you with a thorough market analysis. When all the information is in, a financial analyst generates the financial forecasts and a skilled writer works with your Business Plans Specialist to create your business plan. Finally, your Business Plan Specialist checks the document for flow and accuracy. The business plan is then emailed to you in Microsoft Word format so you can easily make notes or changes to the document. We go back and forth until the product is complete. You receive unlimited revisions for up to two weeks. Extensions are made on a case-by-case basis. However, two weeks is typically plenty of time for entrepreneurs who are serious about getting their plan to market. After final business plan approval, the remaining 50% of the business plan writing service fee is due. After the final fee is paid, we then mail you 3 fully colored, bound and printed business plan copies, including a cd which contains your business plan on a digital file for future change and use.